The original Ruger 10/22 gun stock screw can now be replaced with a precision stainless Allen head screw. It's pretty neat looking but also quite practical as original screws can get the screw slot stripped or buggered up. 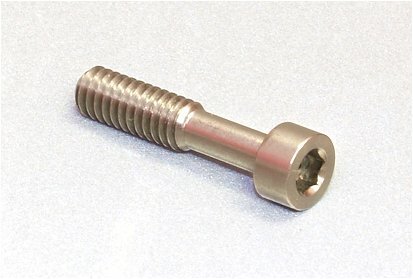 These screws fit any standard Ruger 10/22 stock and any custom stock that uses the standard factory stock screw. Eliminates screw driver mars. Makes it easier to properly torque the stock to the action. This is the most precise screw you could possibly get!The threads were cut in accordance to the threads in the receiver to exacting tolerances. The head spacing of this screw in particular, matched the recess in the stock with precision. On top of this, a 5/32 Allen wrench fit into the head of the screw with very close tolerances. The shaft fit into the hole very comfortably, and to think .... This shaft being hard as steel will never create rusty nuts. WHAT A GREAT SCREW !